This is a quick guide for persons living outside Guyana to get your local consulate or embassy to retrieve a paper copy of your Birth Certificate from Guyana’s General Registrar’s Office (GRO) and send it by mail to your home street address. 1) Locate a nearby embassy or consulate (Guyana uses the British convention of calling their Embassies a “High Commission”. Here is a list of Guyanese Embassies and High Commissions world wide. Application forms for Birth/Marriage/Death Certificates are available at the High Commission. Completed applications should be forwarded to the High Commission for onward transmission to the Registrar General in Georgetown Guyana. The fee is CD$10.00 in cash or a money order made payable to the “Guyana High Commission, Ottawa”, as well as, $12.00 in Canadian stamps to be included for return of certificate. The complete processing time is approximately six (6) – eight (8) weeks. 3) Then click on the link for the “pdf” containing the Birth Certificate form. The “pdf” should then be displayed in your browser and from there you can print it out if you have a printer connected to your computer. If you don’t have a printer connected and configured then you’ll have to find someone that does. On the other hand the High Commission should have paper forms they can send you upon request. 4) Fill out the form and send it back including money and stamps to the high Commission or Consulate. 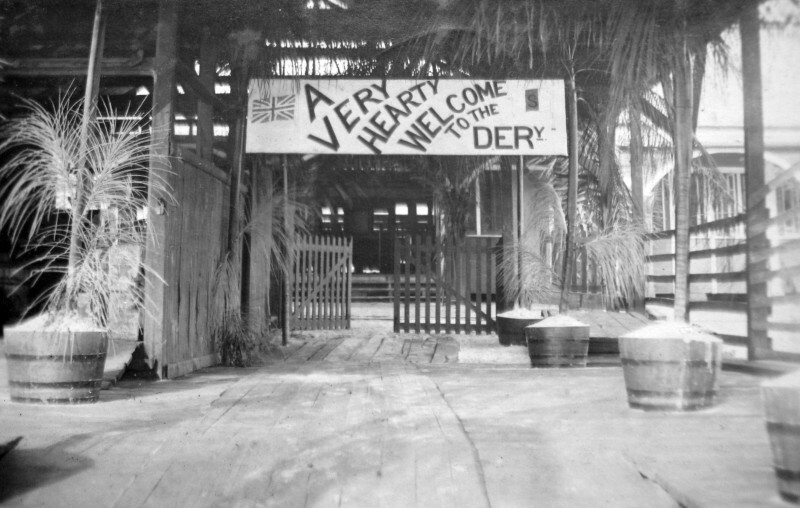 The once popular and well known 1897 Demerara Essequibo Railway (DER) once symbolized the Upper Demerara River and served as a corner stone in its development before Bauxite came to dominate. This railroad provided valuable and safe transportation of commuters and cargo between the Essequibo and Demerara rivers. 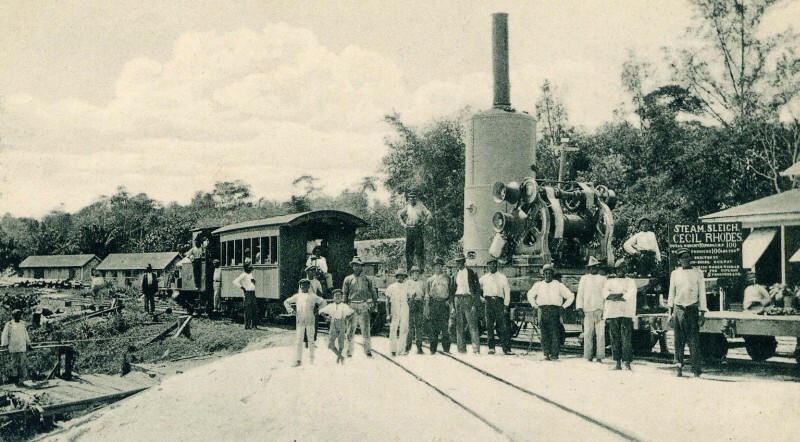 It was Guyana’s first inland railroad. 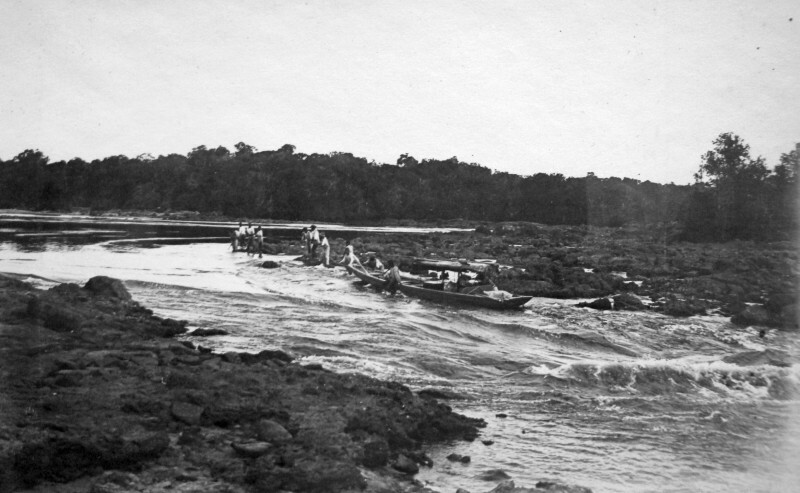 Hugh Sprostons entry to British Guiana in 1840 saw the dire need for transportation across Guyana’s waterways and hinterlands. He established Steam powered vessels across Guyana and built Guyana’s first dry dock in 1867, where damaged vessels could be repaired and new ones constructed. Sprostons had steam brigs and other vessels plying the Georgetown route to as far as Lucky spot up the Demerara River since the 1850s. 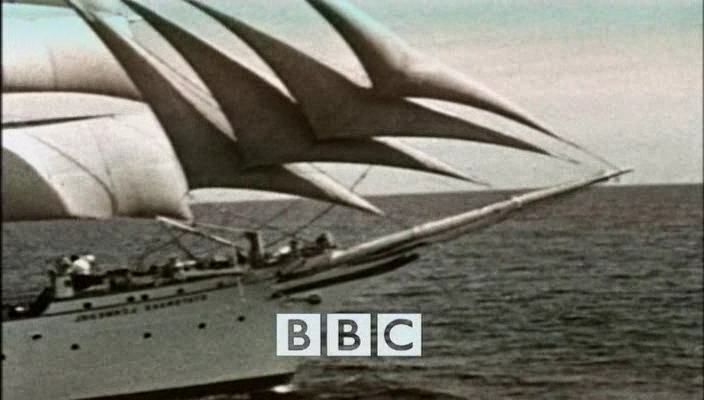 There were also other privately run vessels of that time period. Access up the mighty Essequibo river was a different matter. Navigation was very dangerous because of the many rapids and waterfalls. Many died by drowning as boats frequently capsized in the torrents of the Essequibo. The Idea was born to construction this railway from Wismar to Rockstone. The calm and navigable Demerara River had the width and depth to allow ocean going vessels up to Wismar and it provided access from Georgetown to this railway with transportation continuing from Rockstone via launches to Tumatumari on the Essequibo. The Demerara River is obstructed by large rocks that sit in the middle of the river at the Watooka area. These rocks may have influenced the choice of Wismar for the railway terminus. John Dagleish Paterson of Christianburg lands and Sawmill business was bought by the then British Government in 1894 to set up this Railroad. Sprostons Company LTD then constructed The Demerara Essequibo Railway in the years 1895 to 1897. A loan of $200,000 dollars was given to Sprostons Company LTD by the British Government, to be repaid in twenty years without interest. This light Railway line as it was referred to, was 18 and ¾ miles long and ran westward from the Wismar Terminus to the Rockstone Terminus. 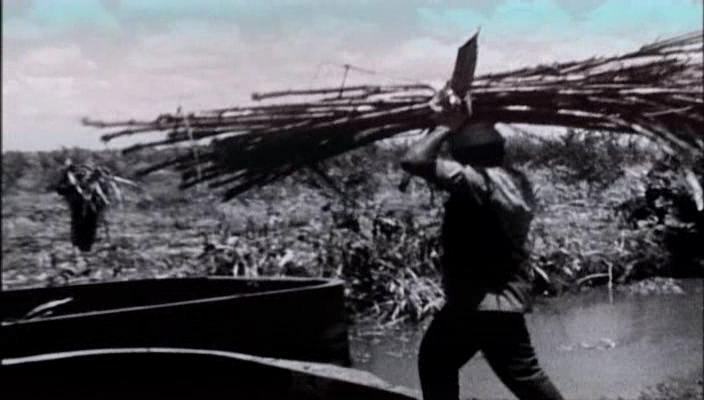 It provided access through Guyana’s primeval forest to the upper Essequibo’s Potaro gold fields, Balata (Bullet wood) trees and endless supply of hardwoods. The demand for Greenheart appeared limitless and British Guiana was the only country that exported this prized hardwood at the time. The Eastern Terminus was built next to the Wismar Steamer Stelling . The train tracks ran south along the Demerara River until it reached the area near the current Wismar / Mackenzie Bridge. 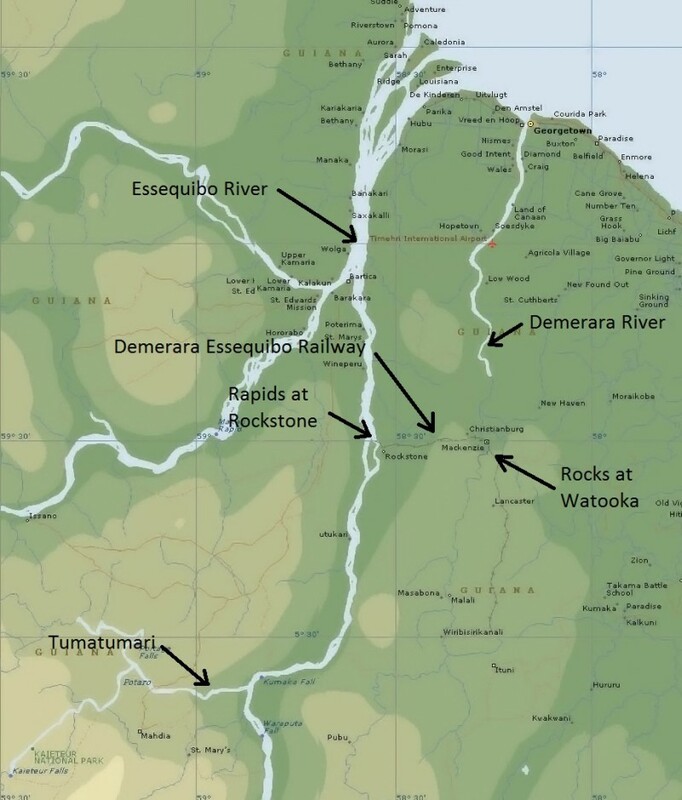 The Railway then swung westward through the forest until its destination at the Rockstone Essequibo River Terminus. The Steamer left Georgetown daily at 8am except on Sunday for Wismar. The Trains departure from Wismar to Rockstone was synchronized to the Steamers arrival fromGeorgetown. On Sunday the Train did not run. At the Rockstone Terminus, one or more Launches with passengers and cargo provided a daily service at departing at 6.30am to Tumatumari on the Essequibo, with Sunday also being the day of rest. At Tumatumari, a launch provided daily transportation to Potaro Landing, taking passengers and cargo. The dawn of 1900 saw this spanking new railroad linking the two rivers, moving people, equipment, timber, cargo of many varieties and most of all hope for a brighter future. Bauxite would later take over as new king. The Demerara Bauxite Company would soon be established with the 1912 land purchased by George Bain Mackenzie. 1917 saw the first mining of bauxite at Akyma and later the construction of the Bauxite plant and housing areas on the eastern shores of the river. With this Railroad, Wismar became the focus and hub of economic activity overtaking Christianburg as the center of the community. However within two decades, as the bauxite industry developed, the eastern bank of the Demerara River rose eclipsing Wismar. The Mackenzie, or eastern shore of the Demerara River still maintains this level of importance today. This railroad brought all sort of jobs for the people in the area. A net work of related businesses grew around the railroad and life improved for many family members. Our special cousin Manly Binning worked from 1919 to 1927 as a machinist at the Sprostons Wismar Workshop. One of my Grandfather’s, Alfred Allicock used to square timber delivered by this train, on the Wismar bank of the River. 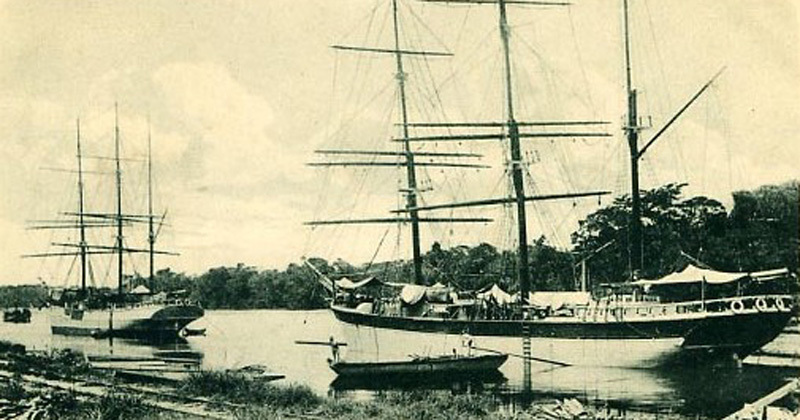 Others travelled to upper Essequibo to work in the timber, balata industry or to mine Gold and Diamond. The Steamer and Railway service became an integral part the lives of our family and people of upper Demerara. The R.H Carr Steamer commissioned in 1927 continued service long after the railroad was closed. The steamer service came to end shortly after the Linden Soesdyke Highway opened in 1968 and brought to an end over 100 years of Steamer service between upper Demerara and Georgetown. In 1960, one of the descendants of John Blount of the Three Friends referred to as Miss Blount spoke with the author Zahra Freeth of “Run Softly Demerara” had this to say about the Railroad, “and when Christianburg went down, so Wismar became bright; with the railway to Rockstone, Wismar became the centre of importance on the upper river which only shows that God will always provide,” she added, “as one place closes down another place opens up, and after Wismar it was Mackenzie.” She went on to say “I don’t understand how people can say there is no God, when here we see the bauxite dug out of the ground, bauxite that God put there so that it would bring work and money to the people of Demerara.” A bauxite ship was passing her home at Christianburg at that moment. The ocean going ore ship was only a stone’s throw from the house, and dwarfed the surrounding scene as it passed along the Wismar water-front. Miss Blount added, “And when I see the big ships, I say to myself, there, if you need it, is another proof of the greatness of God.” Miss Blount was in her eighties at the time of the interview and was also one of our family members. This Railway would continue running well into the Bauxite era until it was closed in the 1940s. The gold decline in the Potaro fields and the switch to the much cheaper petroleum based rubber were believed to be some of the reasons for its closure. Nothing remains of this historical Railway today. The Wismar Steamer Stelling which was closed in 1968 lies in ruins in 2010. Some rail lines are covered by the now Burnham Drive main road in Wismar. The Ruins of the steamer R.H Carr is at Skull point located at the Cuyuni and Mazaruni River junction. The nostalgic memories of this particular ship are remembered and bring a particularly sad feeling upon viewing the ruins. Most of upper Demerara residents that included all of our family members used the R.H Carr for transportation to Georgetown. The exceptions were the many speed boats and launches available. The speed boats took only one hour but did not complete the entire journey to the port of Georgetown but stopped short at the Atkinson base where taxi or bus completed the trip. The R.H Carr took a relaxing 8 hours and held a special bond with all passengers. The slow journey through the meandering Demerara River was punctuated with frequent stops in the middle of the river as passengers got off or into small boats. It was exciting to see the occasional cow transported. Cattle were pushed out into the river and had to complete the trip to pasture by swimming. For many the R.H. Carr was their only contact with the outside world. The area of Linden is like an oasis surrounding by jungle. Most of the area’s new population who came from Guyana’s coastal communities and the many Caribbean Island had little knowledge of inland Guyana. This was a great opportunity and experience for all to see Guyana’s hinterlands. This river trip brought many in contact with the soul of Guyana. They were able to see the many settlements, sawmills, sawpits, villages, farms and life alongside the river. They saw the essence and make up of what is Guyana. I still remember running down the steep steps of the R.H. Carr’s third class as a child to buy gynip and drinking a cold coca cola from D’Aguiar while watching the large propeller of the boat churning up the brown water of the river. We would wave as we passed the people on shore or in boats on the river in a kind of farewell salute to a time of innocence. There were other businesses that provided employment like logging, balata bleeding, farming and gold mining in the area of Lucky Spot and Kanaimpoo. But their influence was dwarf by the importance of this Railway and the other industries that it supported. The turn of that century saw the first automobile and the electric bulb take center stage in upper Demerara, however steam power still dominated. 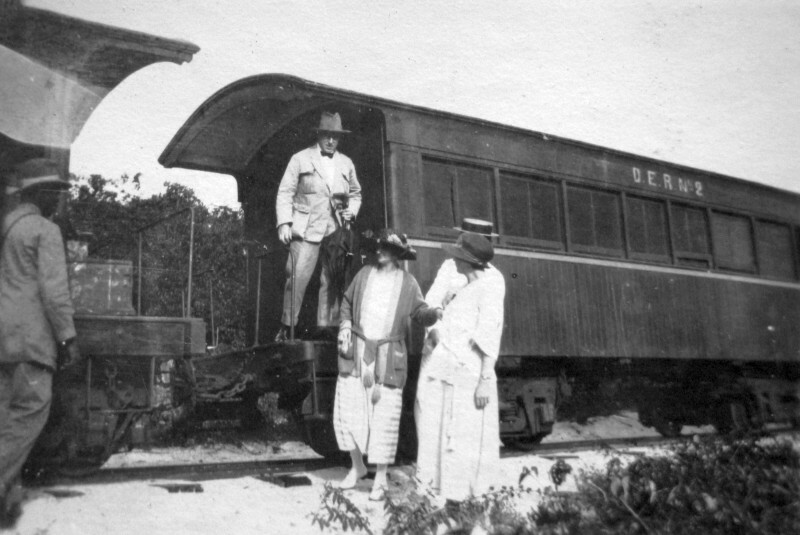 The Demerara Essequibo Railway was essential and a major pillar in upper Demerara’s development. Sprostons Steamers, Railway and Construction Company lead the way as the Demerara Bauxite Company became established. This notable trend to discard and forget history in Guyana is observed once more as the memories of the Demerara Essequibo Railway and this not so distant and significant chapter of upper Demerara is now lost and gone with the wind for many. Remembering the past is a vision of the future. Microsoft has finally caught up to and passed Google with their mapping imagery. At least as far as Mackenzie, Wismar and Christianberg are concerned. To use the map, first click on the picture above (if you right click you have the option of opening in a new tab or window), brief pause while your browser opens the map page, the fun now begins… first left click anywhere on the map, then you can move by dragging and zoom with the mouse wheel. Have fun looking into everyone’s backyard. Probably for the first time you can see the Bauxite mines. I can see the spot at Kara Kara creek where we used to do some serious playing as kids. I never knew there were lakes behind Christianberg, makes me wonder if they are new. 20 points to the first person that can identify Dorabeci Lake. This is the area available in high def, click to go to "Flashearth"
Religion played a fundamental role in the British administration of its colony of British Guiana. It was most probably the policy of the British that in a multiracial country with many races- African, East Indian, Chinese, Portuguese, the indigenous Amerindian, European and their inter-mixtures- and with different cultures and religious practices, the foundation, growth and spread of the Christian religion, could and would convert, indoctrinate, assimilate and unite the many races into a united nation. The colonialists went further. They recognized that the older generation was probably beyond conversion, indoctrination and assimilation, so their policy was to focus on the children, the new generation. Churches dotted the landscape of Georgetown and environs, as well as the countryside. A school system was created that welded the school and church into one unit. For example, the school at St. Stephen,Adelaide and Princess Streets was the St.Stephen Church of Scotland School. The school on Smyth Street was the St. Phillips Anglican School. The one at Sussex and Charles Street was the Carmel Roman Catholic School; the one in Kingston was the Kingston Methodist School and at High Street and Brickdam was the St. Andrews Anglican School and so on. And as an integral part of the plan, a church was next or near to the school. Children of all races and religions (including Chinese, Hindus and Moslems) attended the school and were required to say a Christian prayer at the beginning and end of the school day and attended church services once a month. The strategy was in full gear until the colony became independent. With independence, church schools came to an end. Apart from the well-known Catholic, Anglican, Methodist, Presbyterian, Episcopalian, Lutheran and other Churches, there were the Jehovah’s Witnesses, Assemblies of God, Pilgrim Holiness, Unity, Seventh Day Adventist and others. Not wishing to seem obvious in their policy, there were also Hindu Temples and Moslem Mosques but they were far outnumbered by Christian Churches. There was also a little known sect called the Jordanites, all entirely of the African race. The Jordanites, at least in Georgetown, preached individually, along with a Sister. Those who ministered in Georgetown, preached at street corners or at Bourda Green, opposite the Market, Stabroek Market Square,near La Penitence Market and near Kitty Market, mostly on Sunday nights. All used the text of the Holy Bible for their sermons but interpreted them in their own way. There was no singing of Hymns at their religious meetings. “…For many years, members of the Jordanites in their lily white robes and their Leader with a long staff or crook-stick, were a familiar sight in Guyana. They were members of a Church established by Elder Nathaniel of Jordan at Agricola, East Bank Demerara. Elder Jordan taught a ‘new doctrine’ (free from the popish traditions and based on principles laid down in the Holy Scriptures contained in the Old and New Testaments) as received from Joseph McLaren of Grenada. Elder Jordan established his Church in 1917 and built the first temple at Agricola in 1924. He was succeeded by Elder J.N. Klein. Both men and women dressed in lily white robes, women wearing white bandannas and men wearing white turbans. Many of their meetings were held near busy street intersections. Baptisms took place on the beach of the Atlantic Ocean. They wore no shoes in their Temple, leaving them outside the door. Many ate no meat at all, others limited the kinds and quantities of meat they ate. Jordanites also forbade the use of alcoholic beverages. It was Sunday night and the Jordanite preacher was prepared for his service. Brother Hezekiah and Sister Deborah were dressed to kill. The Jordanite was resplendent in a white turban perched securely on top his head, and a long, flowing, lily white robe, held slightly around his waist by a white silk tassel. He had on thick white ‘yachting’ shoes glistening from a coat of Propert’s White Renovator. In his hand, he held a white shepherd’s staff. He was from Agricola on East Bank Demerara. He was tall and lean. Sister Deborah wore a long, white gown, with a gold coloured tassel tied tightly around her waist,a pair of white Delilah sandals and her head was covered with a white bandanna. A large, black bottle lamp illuminated the table at which she sat and the surrounding area. On the table, decorated with a white table cloth, was Brother Hezekiah’s Gold Leaf Bible – the edges of the pages were gold-coloured. A sizeable crowd slowly gathered at the venue on the concrete pavement abutting the La Penitence Rum Shop at Saffon and Sussex Streets. While he waited for the attendance to increase, he walked up and down, shepherd’s staff in his right hand and a tibiciri fan in his left. He continuously fanned his face as he walked up and down, chanting “Fan me soldier boy fan me, fan me soldier boy fan me, fan me soldier boy fan me, all me sins done gone.” Gold teeth gleamed in his mouth as he chanted. His chanting and his strutting around attracted the attention of pedestrians and bicyclists who stopped and joined the gathering. When he recognized that the crowd was large enough and ready to receive his sermon, he walked to the table and put down the fan. He also chose a time when the road traffic along Saffon Street and Sussex Street had dwindled. The distinguished-looking preacher strode across the rectangular area, divine and sanctimonious looking but with pomposity, to the edge of the space where there was a white flour bag cloth on the pavement and pointed it out to the people. Exuding confidence, he pampazekked to the centre of the area and launched into his sermon where he left off the previous week on the events surrounding the Biblical story of Lazarus who was raised from the dead. He reminded his audience about Lazarus and how fond Jesus was of him. He spoke of how Lazarus loved animals, especially dogs. He told the people “Let me remind you that there are animal dogs and there are human dogs.” He evoked a guffaw of laughter. Sister Deborah did as ordered. She opened the Bible, pushed it closer to the bottle lamp and read aloud, clearly and distinctly, each word emphasized with driplets of spit, “And moreover the dog licked the sores of Lazarus,” she declared, face as serious as a judge but perspiring from the heat of the bottle lamp. She wiped some spit from the side of her lips, using the back of her right hand. “All who got ears to hear let him hear and understand. You get it you people? Did you hear clearly and distinctly what Sister Deborah read? Did you hear each individual word clearly? Did you let it sink into your brain? Do you understand what was said? I repeat for your benefit and the glory of God: And moreover the dog licked the sores of Lazarus,” declared the Jordanite Priest in a trumpeting voice but reverently. Brother Hezekiah paused to scan the faces of the crowd and the effect of his sermon. He was convinced they were captivated by it and by his oratory in its delivery. Shock and awe enveloped and overpowered the audience. They didn’t know and failed to appreciate what the Priest was asking them. What did the name of the dog have to do with the story? No one heard any dog’s name mentioned in any case. Deep silence gripped the crowd. You could have cut the silence with a knife. “Come on, come on all of you. Come on you offspring of Beelzebub, speak up, not shut up. You just told me you heard and you understood what I and my Sister took time and great pains to propound. So tell me you wise-looking people, what was the name of the dog that licked the sores of Lazarus?” inquired the Preacher. Complete, absolute and profound silence again greeted the question. Loud cheering greeted the challenge. Loud cheers and hand claps greeted the Jordanite’s revelation and oratory. Silver coins rained down on the white flourbag cloth and also red one dollar bills. The year 1913 was propitious for British Guiana. Sir Walter Egerton was the British Governor. For the first time, the head of the British Sovereign appeared on British Guiana Postage Stamps. The first map showing the Corentyne River as the boundary between British Guiana and Dutch Guiana (Suriname) was published. 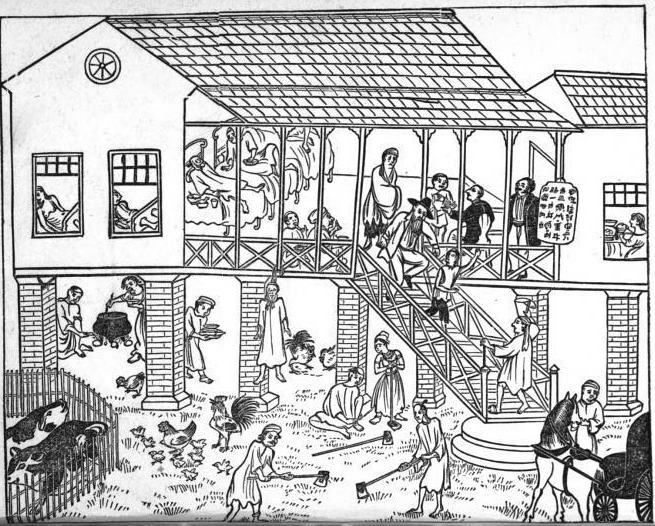 The population of the colony reached some 300,000 and the population of Georgetown was 58,000. The Amerindian population was 13,000. Sugar, known as Demerara Crystal, continued to be the major export. In 1913, the first airplane flight was launched by George Schmidt. But the year was also one of mystery. In that year alone, there were two major, mysterious fires in Georgetown. On March 7, the Brickdam Cathedral of the Immaculate Conception, the premier Catholic Church in the colony was burnt to the ground. At the time, the Cathedral was highly regarded for its structural beauty and fine edifice. There were two versions about the cause of the fire. One was that a plumber was using a blowtorch near the top of the great tower of the Church when something went wrong and the building went up in flames. Another version was that a workman, a Frenchman named Bencher Cornelle, innocently left a coalpot burning in the tower while repairing it and the result was an inferno. The fire was a great shock to the people of Georgetown since the Cathedral was regarded as a national landmark. It was also the main place of worship for Catholics. The Church was packed to capacity on Sundays. The other fire occurred in December at a time when the people were deeply engaged in preparations for the Christmas Season. On Monday, December 22, just three days before Christmas, at around 8.25 a.m., there was a loud and violent explosion in the western section of Georgetown. The thunderous and deafening noise, so it was related, was heard not only in the Capital but on the East Coast, East Bank and West Bank Demarara. The explosion took place at Chin-A-Yong’s shop on Lombard Street. There, according to reports, fireworks were being manufactured in a vault. The “little bombs” were a delight for little boys to throw around on Christmas Day and Boxing Day. The explosion blew Chin-A-Yong’s business place sky high and was followed by a massive conflagration. It also killed 20 persons and injured many others. The raging fire also almost destroyed all of Lombard Street. A swift breeze from the northeast turned the raging fire into an inferno. News reports stated that valiant work was done by the Fire Brigade, the Police, the Artillery, the Militia and Volunteers, but their efforts were retarded by low water pressure. By the time the fire had vented its rage, Bugle Sawmill was no more. Psaila’s Store, Hope Sawmill, Bugle Building, Bettencourt’s Sawmill and the Demarara Company warehouse with 67,000 bags of sugar were all burnt. Several days after, when the Police and Fire Brigade inspected what was left of Chin-A-Yong’s place of business, they found a secret underground cellar. The authorities believed it was an opium den. Opium smoking was a serious problem in British Guiana at that time. The year 1913 turned out to be propitious, mysterious and maybe just another instance of misfortune for the unlucky number 13. For further reading you can access an online version of “The British Guiana handbook, 1913” edited by Alleyne Leechman just by clicking. One of the impressive cultural events of long ago in Guyana was the Tadjah ( or Tazia) festival. It had a Muslim origin but was eventually assumed by Hindus. This was frowned on by the Muslims. But the festival involved nearly all communities who either joined in, observed or benefited from the spectacle that Tadjah was. The feature of the event was a towering Tadjah structure about 30 feet high representing an ornate tomb. It was a sight to behold. It’s frame was made of bamboo but it was finished in tinsel, pieces of glass, beads, little lanterns, tassels and paper in a grand variety of bright, rich colours. During the day, the Tadjah was taken in a procession along the road as the following shouted “Hoosein! Hassan!…Hoosein! Hassan!” over and over. The legend was that the first Tadjah was a tomb built centuries ago by Ali, father of Hoosein and Hassan, for the two sons he lost through treacherous murder during a religious war. Ali, it was said, was the son-in-law of the Holy Prophet Mohammed. He was married to the Prophet’s daughter. Hoosein and Hassan were grandsons of the Prophet. The tomb Ali built was monumental and costly, so much did he love his two sons. 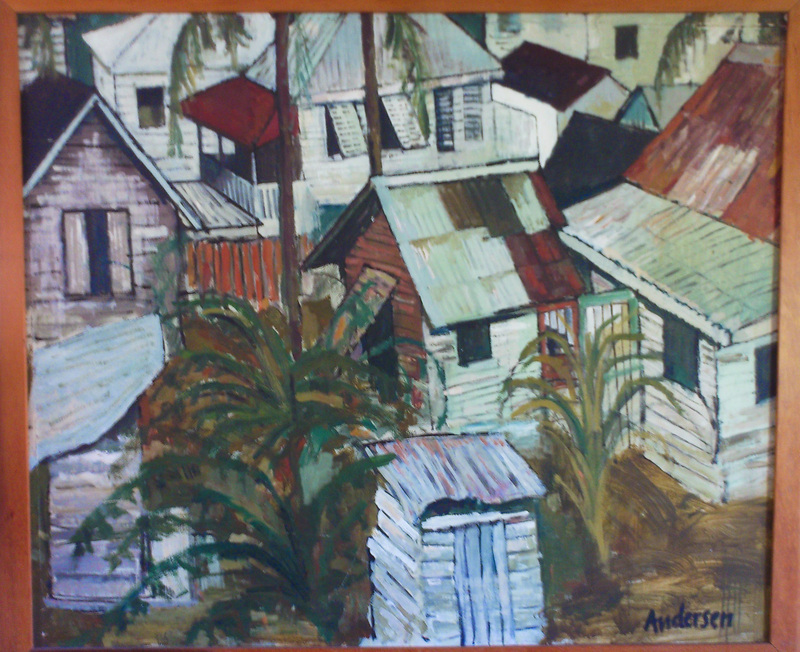 The bamboo and paper structures of the Guyana Tadjah, grand as they appeared, were only poor replicas of the original. The peoples’ shouts of “Hoosein! Hassan!” were in remembrance of the young men on the anniversary of their death, observed in the month of Mohurrum (Muharram), according to the Muslim calendar, 10 days after the appearance of the new moon. The night scenes during the Tadjah festival were also impressive. Lights were everywhere and of all kinds – gaslamps, lanterns, candles, bottle lamps and floating wicks. Another attraction of the festival were stick fights. They were called “gatkas”. Each fighter had two long, hard sticks called dantas – one danta in each hand. 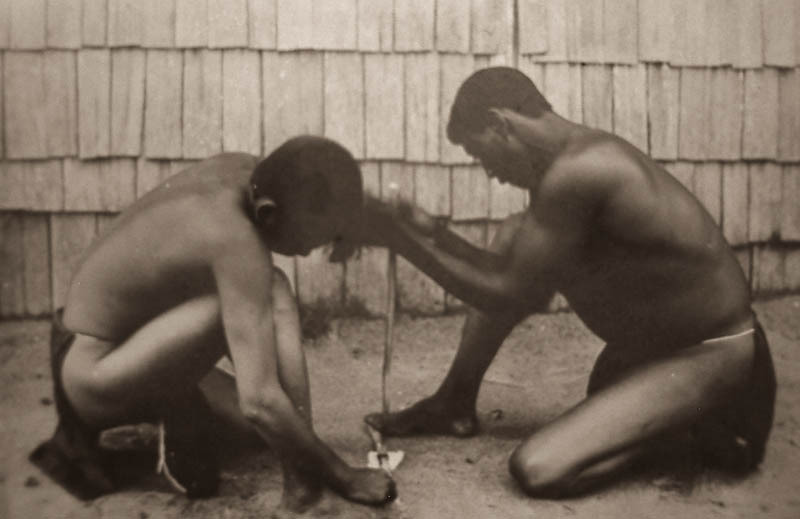 As the fight proceeded, there was no aggressive combat but rather a skilful stick play in which the dantas were struck against each other, rhythmically, as the fighters danced. Music was made on drums- mostly large, waist-high- made from wooden barrels and sheepskin or goatskin. The drums were beaten with heavy wooden drumsticks. In a village, there were as many as 100 drums lining the roads, manned by drummers competing for applause. Drumming continued through the night, accompanied by handclapping and singing. There were other attractions. Many of them were provided to entertain the large crowds and not because they were Muslim or Tadjah related. The food items on sale were Muslim and Indian sweetmeats . Africans sold blackpudding and souse which were detestable to both Muslims and Hindus and the sale frowned on but not prevented. Some communities even had Greasy Pole climbing or walking across and tightrope walking. 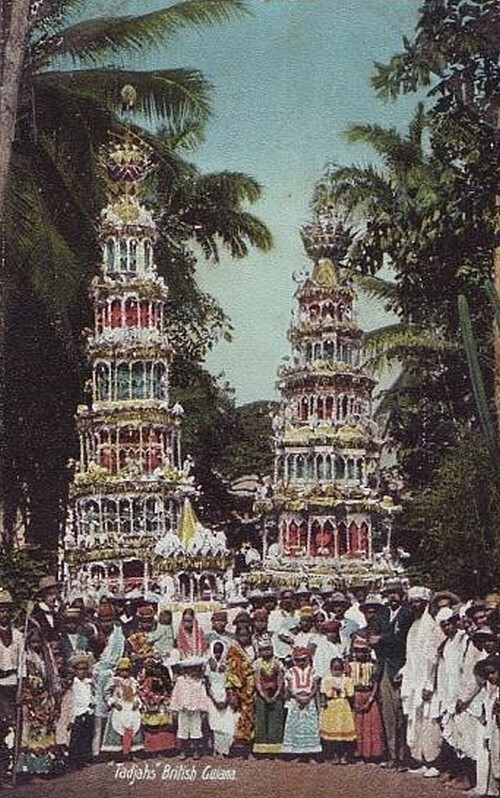 At the end of each festival, the Tadjah tower was thrown into the sea at high tide. Every year, a new one was built and decorated and again thrown into the sea. The extravagance of the festival, it’s kaleidoscope of bright colours and the profusion of eye-catching decorations led to the creole term “coolie tadjah” to describe any get-together or party that exuded bright colours and fandangles or even a flashily dressed person. Tadjah eventually came to an end in Guyana in the late 1930s. Alcohol caused ceremonial stickfights to degenerate into fights to the death and other acts of violence which, together, altered the character of the festival. The festival, some said, generated hostility between Muslims and Hindus which resulted in murders and other acts of violence. Some influential Muslims regarded the Tadjah festival as unIslamic and moved to have it banned. 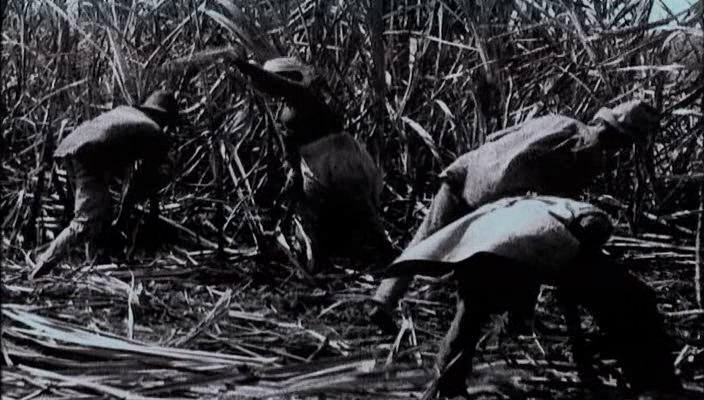 Another reason was the fact that the festival disrupted work on the sugar estates and therefore cane harvesting and sugar production. Rumshop owners, mostly Portuguese, were very upset with the ban because the Tadjah festival generated increased business every year. While it was banned in Guyana, Tadjah continued in neighbouring Trinidad and Tobago where it was called “Hoosay”. The banning of the Tadjah festival in Guyana brought a sad end to what was a most colourful and bacchanalian event that observed the past and celebrated the present. The Wai Wai is now an endangered Amerindian tribe in Guyana. In 2007, according to International Cry online website, there were only 240 Wai Wai left in Guyana. The Wai Wai is one of nine indigenous Amerindian tribes in Guyana. The others include the Patamona, Arecuna, Macusi, Wapisiana, Carib, Warrau, Arawak and Akawaio. Wai Wai means “tapioca people” and they were given that name because of the enormous amount of the tapioca (cassava) they eat. The Wai Wai people and its tribal territory were discovered by the famous explorer R. Schomburgk during his exploration of the province of Essequibo in 1837. 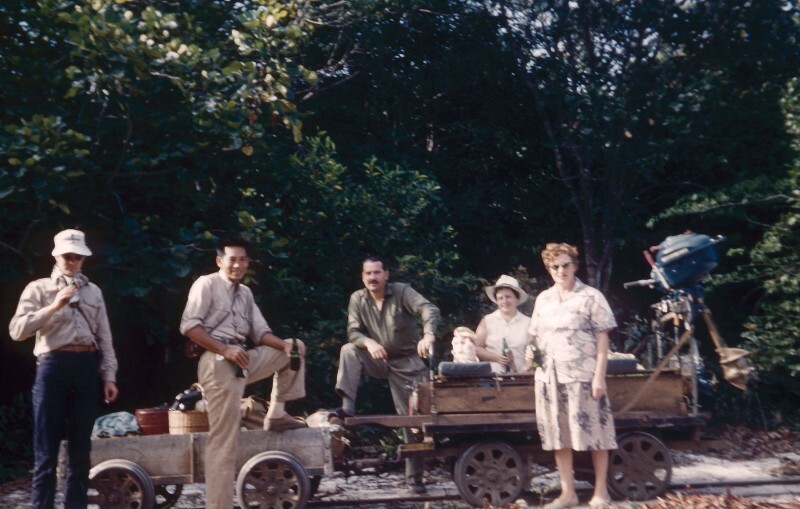 U.S. Protestant Missionaries established a permanent Christian Mission near the Wai Wai tribal area in the 1950s. The Paramount Chief of the Wai Wai and his tribe converted to Christianity by the end of the 1950s. The Wai Wai live in small remote villages in the southernmost tropical forest of Guyana. 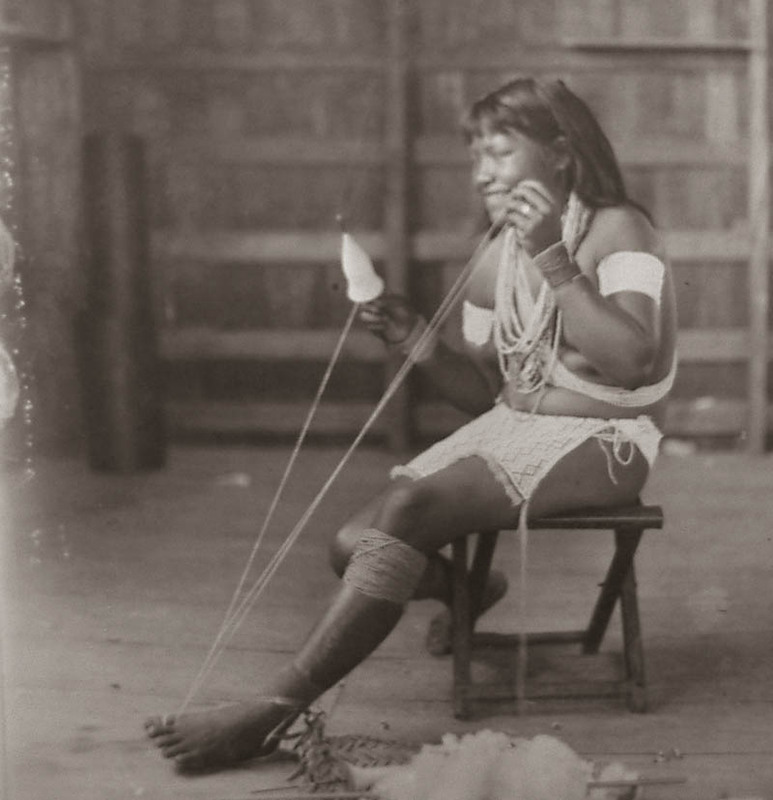 They migrated from Brazil in the early 19th century and their population increased to some 1,250. As the tribe expanded , so too did trade and marriage contracts. When the Protestant Mission was established, nearly all the Wai Wai relocated near to it. In the 1970s, due to the uprising in the Rupununi area and events that followed, there was massive re-migration of the Wai Wai back to Brazil. By 1989, there was only one major tribal area remaining. Their tribal land, to which they hold title, covers about some 2,300 square miles. The area is known as Konashen and includes the headwaters of the mighty Essequibo River. The paramount Chief of the people is the Kayaritomo. The Medicine Man is called a Yaskomo. The Wai Wai is an artistic tribe that makes beautiful baskets and many other craft, including pottery, woven combs, bone flutes, bows and arrows, blow guns, graters, beaded aprons and necklaces. Their traditional dances are known for imitating the movements and calls of various forest animals and birds. The Wai Wai have a subsistence way of life. It is based on farming, hunting and fishing. The cycle of dry and rainy seasons produce plenty during the former and scarcity during the latter. Their main farming crops are bitter tapioca (cassava) used to make bread (cassava bread), farina, casareep and drink (pywari and cassiri). They also plant fruit trees, arrow cane and cotton. The forest provides building material, wild fruits and nuts. The men hunt with arrows, bows, trained dogs and sometimes shotguns. Their meat supply comes from the wild cow, wild hog, labba, accouri, deer and wild fowl. Many varieties of fish are caught. In 2007, during the second Latin American Parks Congress, the Wai Wai tribe of Guyana declared their land a “Community Owned Conservation Area” The tribe has banned mining and logging from their land in the tropical forest in remote southern Guyana near the Brazil border. They have pledged to pursue a sustainable economic strategy based on eco-tourism, research and traditional crafts. The paramount aim of the people is the preservation of their culture. Some of the tribe plan to become Forest Rangers. “We have always been keepers of the forest that support us, “ said the Kayaritomo. One major event for the Wai Wai was when the Governor-General of Canada, Sir Roland Michener, visited them in the 1970s. A Guyana Foreign Service Officer who was with the delegation said it was a surprise when the visitors discovered that the Wai Wai had evolved an indigenous religion, based on Christianity, which they called the “Hallelujah Religion.” He also said that when a block of ice was unloaded from the aircraft that took the official delegation to Konashen, a Wai Wai put his hand on the ice, shouted, withdrew it quickly and fell to the ground in reverence. The Wai Wai had never seen ice before. Another had to do with the church which served the area. The Chief requested a piano for the church from a British citizen who visited the tribe. A Grand Piano was flown by BWIA to Guyana in 2000. The 800-lb piano was then transported by Skyvan to near Konashen and then, while still in the crate, was dragged to the church where it was later installed. Region 9 – Upper Takutu/Upper Essequibo. Region 9 – Macusi/Wapisiana/ Wai Wai. 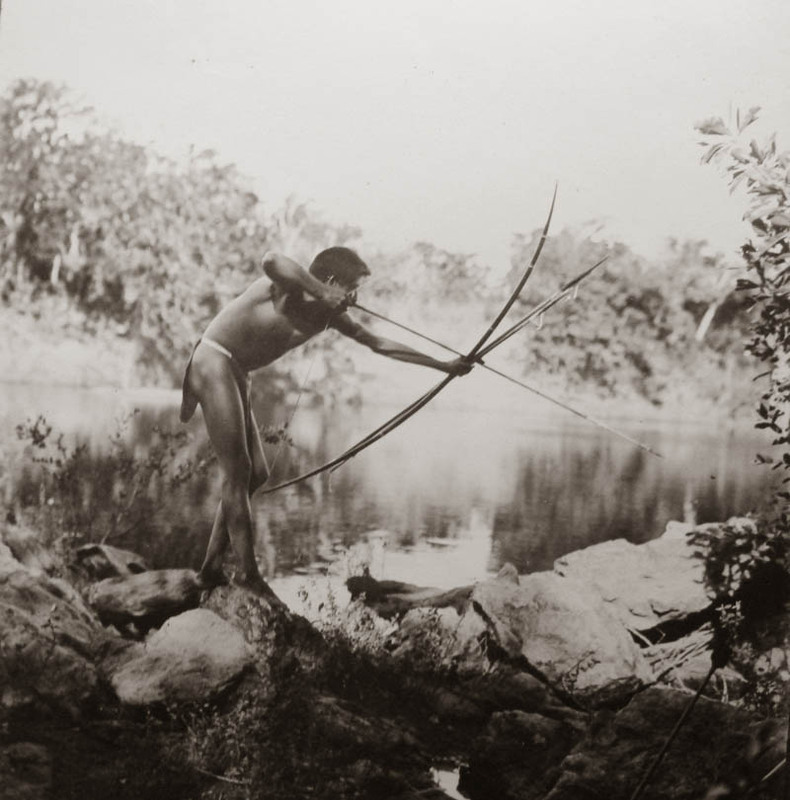 * Photographs are not necessarily of the Wai Wai people and are from the R.H. Carr family album provided by Armorel Clinton.